Cotton, a Perfect Fabric For Summer! Soaring summer heat makes one feel uncomfortable in any clothing except cotton. India being the second largest producer of cotton in the world, this natural fabric comes as a survivor to keep us cool in summers. Cotton clothing has a lot of benefits over synthetic ones. One of its major highlights that attracts people is that it is hypo allergic and dust mite resistant. It is supposed to be the best for people with asthma, skin allergies, skin irritations and infections. Cotton fibers stay away from skin and provide a perfect thermal insulation in summer. It has good moisture control properties and is best suited even during exercise, keeping away moisture from building up between skin and clothing. Cotton is a long lasting fabric. The International Forum for Cotton states that cotton has high tensile strength and durability. It can endure high temperature, is easy to wash and maintain. It is 30% stronger when wet and can withstand many washes. It is also interesting to know that cotton is the preferred choice for fire fighter uniforms, as it can be coated with flame retarders. 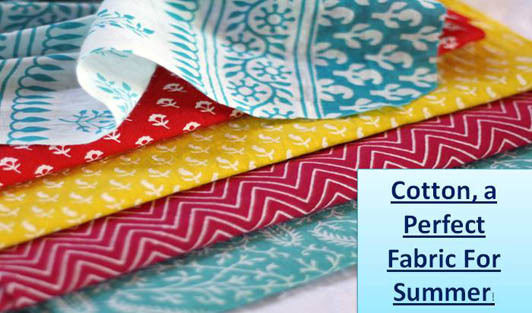 Cotton is the most comfortable fabric in any weather and undoubtedly the best in summers! Keep yourself cool with your favorite cotton clothes, sunglasses, and a scarf or a hat, and beat this heat!